The legendary TT Mountain Course will reverberate to one of the most distinctive racing sounds from the 1960s at this year’s Classic TT Races presented by Bennetts as the iconic 250cc Honda-6 will complete a demonstration lap around the 37.73-mile circuit on Monday 28th August, the second race day of this year’s Classic TT meeting. Owned by Team Obsolete’s Rob Iannucci, the ‘Six’ is the first example of Honda’s ground-breaking machine and is the only surviving RC165. Jim Redman first rode it, followed by Stuart Graham before Mike Hailwood took it to victory in the 1966 Czechoslovakian Grand Prix. 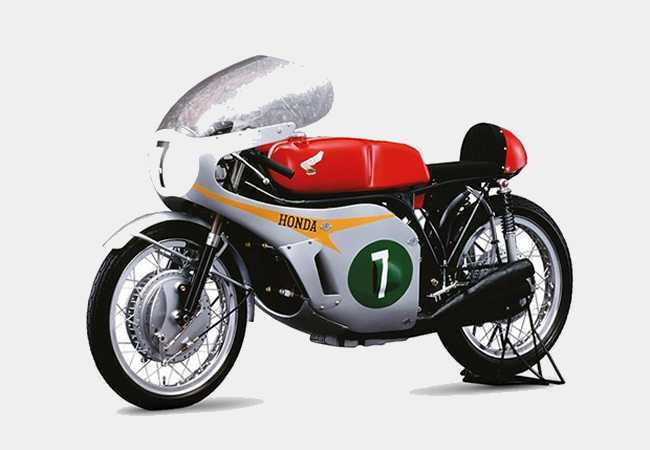 Redman raced what was the first Honda ‘Six’ at Monza in 1964 where it was rushed from Japan in the passenger compartment of a commercial airplane. The Rhodesian took third at Monza and then took the bike to its maiden victory when he won the 1964 250cc Japanese Grand Prix. The ‘Six’ was one of the most interesting and most technically advanced racing motorcycles of its time and was built to put a stop to the run of victories for the 250cc Yamaha which, in the hands of Phil Read, won the 1964 and 1965 250cc World Championships. Although the six-cylinder Honda 250 did not win the championship in 1965, it was able to put up a competitive fight against the two-cylinder Yamaha, ridden by Read and Mike Duff. Redman won the 250cc TT that year for the fourth time in a row. Yamaha’s response was to produce an updated two-stroke, four-cylinder motorcycle, built solely to stand up to the competition from the Honda. Ex-factory Honda rider Steve Plater, winner of the 2009 Senior TT Race and current presenter on the TT and Classic TT ITV4 highlights programmes, will ride the bike with the Lincolnshire rider completing a demonstration lap on Monday 28th August, ahead of the Motorsport Merchandise Superbike Classic TT Race. The “Six” will first appear at the VMCC’s Festival of Jurby on Sunday 27th August for some shakedown laps. Dave Roper, winner of the 1984 Senior Classic TT, will ride the Honda at Jurby on the 27th. ITV4 will feature the Honda Six in their highlights programme with Plater, as expected, embracing the Classic TT spirit by riding in replica leathers and helmet, evoking memories of the machine’s 1960s heyday. Team Obsolete owner Robert Iannucci has supported the Classic TT with a series of iconic bikes with Mountain Circuit connections since the event was established in 2013 and both Redman and Graham will attend the Classic TT to talk about their experiences with the bikes. "The Classic TT has now emerged as the crown jewel of classic motorcycle sport worldwide. We are honoured to have received an invitation every year since its inception to share our historic bikes with our friends. All of us come because we must. Regardless of where we hail from, we are all drawn to something very special. We all know that we belong here. We see it in each other’s faces and we feel it in our bones."